Well, still my pencils and papers are in limbo, between dwelling places. As an old friend of mine would put it, I’m “jonesing” on lack of creative time. My eyeballs are bulging, and the veins in my forehead are throbbing. So it feels, at least. Recently, I’ve been reading that simple coloring relaxes adults in a way similar to meditation. I miss my coloring! I also have a long, thoughtful, and hopefully not boring commentary on rainbows to present..but it doesn’t make much sense to present that without the drawing to go with it. Hmmm, well, back to the other subject. My flight from New York. 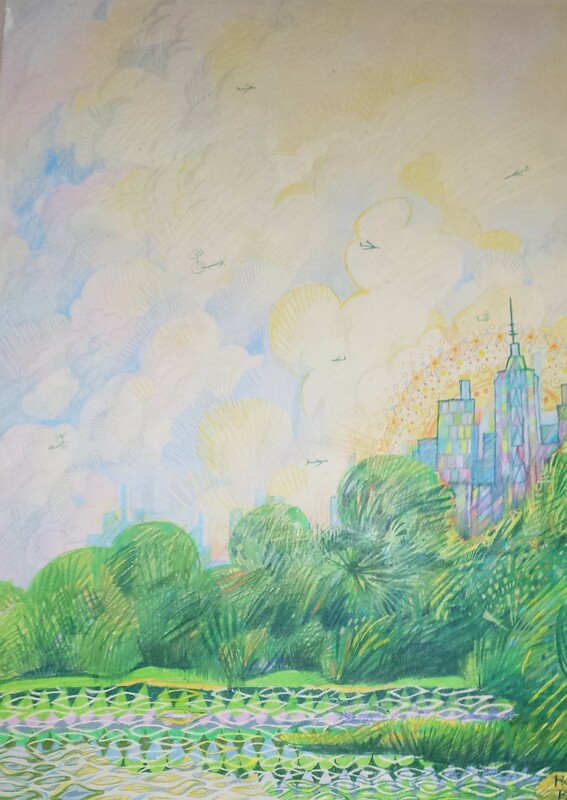 Digging through old artwork during my move, I came across an old drawing of mine, devoted to the dream of somehow, someday, going to live and succeed in New York. At the time, I thought it was impossible to achieve. However, it did happen. How many people actually have a dream come true? I’m one. Previous PostHappy Holidays and All That Jazz…Next PostOn the Subject of Rainbows….